CELEBRATING ONE MILLION CUSTOMER INTERACTIONS. THANK YOU FOR YOUR TRUST IN US! At Bharat Petroleum, customers and their convenience are integral to all our business operations. Customer centricity being one of our core values, our endeavour is to develop and deliver various products and services which make things simple for our consumers. With the same goal, we have introduced BPCL Customer Care SmartLine (1800 22 4344), a single window system to listen to queries, suggestions, feedback and compliments related to any of our products and offerings. 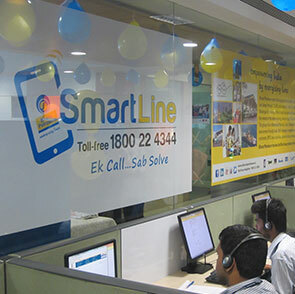 SmartLine is our all India contact centre for consumers across four marketing SBUs i.e. Retail (Petrol Pumps), LPG, Lubes, I&C, Aviation. SmartLine also functions as a 24x7 Emergency Helpline(Gas Leakage) to provide immediate assistance. This Toll-Free number is a direct connect between our customers and field teams through which customers can connect with BPCL anytime. The system is so configured that an SMS/Email confirmation is triggered at the time of registration and closure of a customer interaction. The BPCL SmartLine, 1800-22-4344, is expected to set a new benchmark in customer service and provide real time assessment of our service standards across different cities for all our touch points. We, at Bharat Petroleum, are all set to live upto the tag line for BPCL SmartLine – "Ek Call Sab Solve". We are just a call away!